We have a league for everyone: women, men, juniors, seniors, high school students, university students, and any combination you can think of. Get more information and find out when your preferred league is playing. We wouldn't be a curling club without curling, right? Yes, but there is so much more to the VCC that adds to the experience: come down and be social at the Club! Our bonspiels are 2nd to none for FUN! Come out for competition, stay for friendship. Get taken out by someone you've just met! Our Adult Learn To Curl Program is guaranteed to have you throwing rocks at houses in no time! Want to fix your out-turn in-out? Do it yourself during our practice ice times, or get help from a pro at one of our clinics. Click here for more information. Everything you want to know about becoming "part of the club". We know you want to! Corporate outings, parties, private events, family reunions...connect over curling! 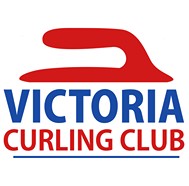 Find information here about the Academy - proudly hosted by the Victoria Curling Club.